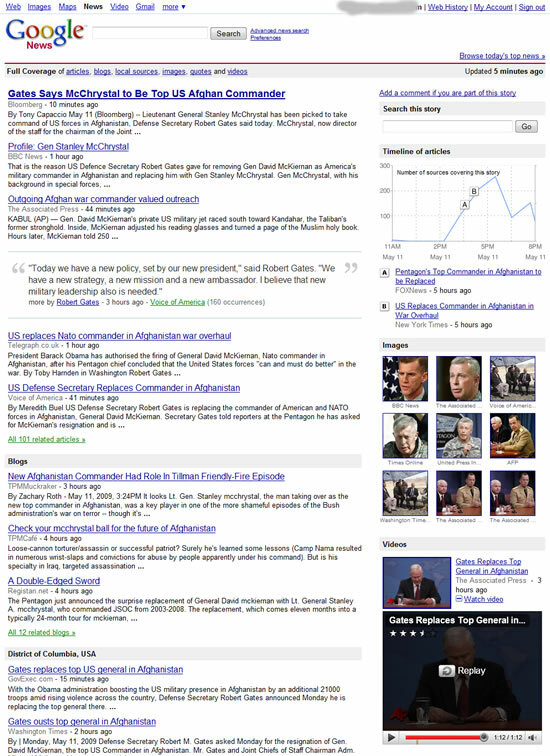 Google News clusters got better today with categorized content from blogs, local news, quotes, images and videos. When you click on â€œall news articlesâ€ links below each cluster in Google News they will show cluster pages with all the above said sections, each section like blogs, local sources also carry links to more articles. The images related to the news will lead you to the publisher website, and the videos can be watched inline on the cluster page itself. Look this cluster for example which shows all the sections. From Google News Blog: The story page includes timely and relevant information from different sources indexed in Google News. Depending on the most recent coverage and materials available for a given story, the page features top articles, quotes from the people in the story, and posts from news blogs. You’ll also find image thumbnails, videos, articles from sources based near the story, and a timeline of articles to trace media coverage of the story.